The weather service has expanded a Winter Weather Advisory to include the entire D.C. area. Drivers should expect "slippery road conditions and sidewalks," and the hazardous conditions may linger overnight, as temperatures fall below freezing. This could affect the Friday morning commute. Here's what you need to know. WASHINGTON — Light snow Thursday evening could bring a slushy inch or two of precipitation across the region and could make for a messy commute into Friday morning, the National Weather Service is warning. 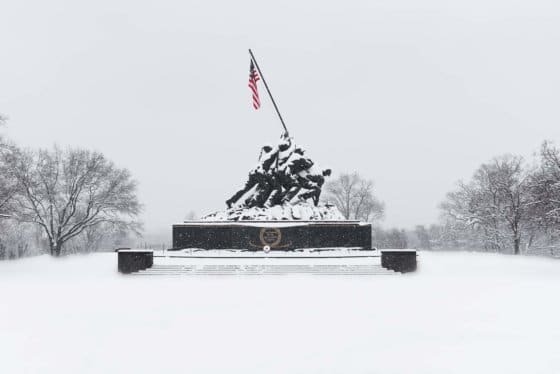 The weather service has expanded a Winter Weather Advisory to include the entire D.C. area. Drivers should expect “slippery road conditions and sidewalks” and the hazardous conditions “could impact the evening commute after sunset as temperatures fall below freezing,” the weather service said. The advisory is in effect from 6 p.m. Thursday to 4 a.m. Friday. The messy wintry mix comes ahead of some wild weather this weekend: Heavy rain, a wintry mix and then a powerful blast of Arctic air that will bring dangerously cold wind chill temperatures to the D.C. area this weekend. Here’s what you need to know the weather-wise. The wintry mix is expected to start as the sun goes down Thursday, according to Storm Team4 meteorologist Chuck Bell. “Not expecting a whole lot of snow but a slushy inch or so around town is certainly a possibility,” he said. 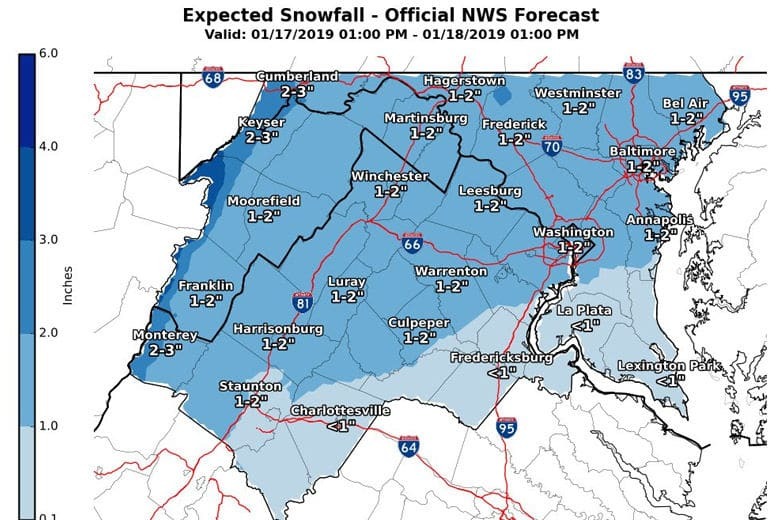 Areas to the north, such as Loudoun County, Virginia, and northern Montgomery County, Maryland, could see a bit more snow accumulation — about 2 to 3 inches. Things are expected to clear up Friday, with partly cloudy skies and highs near 50 degrees. But heavy rain, with the chance for some snow mixed in, and plummeting temperatures are expected this weekend. Saturday starts cold and dry, Bell said. There’s a chance some light snow that eventually becomes all rain late Saturday afternoon and steadier rain Saturday night into Sunday morning. Then on Sunday, the rain may end with another “quick shot of snow” as bone-chilling cold air rushes back into the area. Temperatures in the 40s Sunday are expected to fall very quickly throughout the day, into the 20s by about 5 p.m. that afternoon and all the way down to near 10 degrees Monday morning.